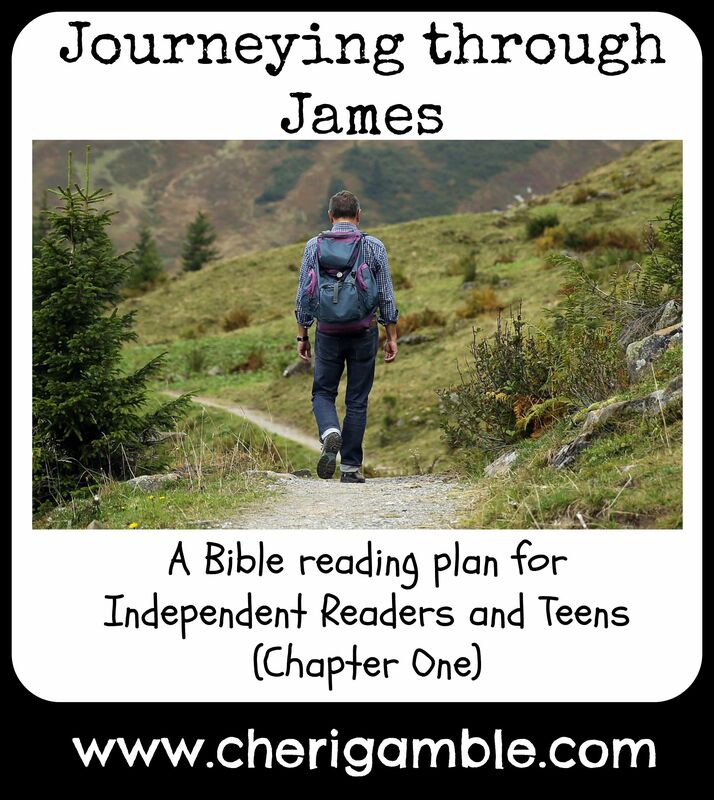 Welcome to chapter one of Journeying Through James: A Bible Reading Plan for Independent Readers and Teens. This post contains an 8 week plan that covers the first chapter of the book of James for your older child and teen. This plan is meant to be completed by your older child on his own as he learns how to have his own time with God. Each day’s reading includes at least one “Think about it” question and “Pray about it” challenge, and it is my hope and prayer that this plan will help your child grow in his relationship with Jesus. If you have a younger child, or if your older child desires more hands-on activities such as crafts, snacks, and videos, you can find all of that on the Bible reading plan for young children. The Scriptures provided in this Bible Reading plan are the same ones studied in The Book of James: A Hands-On Homeschooling Curriculum. This curriculum is available in both a print book and pdf format, and allows you and your child to dig even deeper in James this school year. It also includes ideas for using James throughout the curriculum in such subjects as Math, Language Arts, History, Science, and Art. If you are a homeschooling family looking for a fun yet challenging and applicable Bible curriculum, please check this one out! If you work with children in a ministry setting or if you are a family that is looking for ideas for a weekly family Bible time, you might be interested in Journeying Through James: A 35 Week Study for Families and Churches. This study includes opening activities, a detailed lesson time, and additional activities such as crafts and snacks, and also includes a parent letter along with a complete copy of both of the Bible reading plans that you can send home each week to encourage your children to read the Bible on their own. Click here to view a sample lesson from this study. Thanks for using the Bible reading plans, and may God bless you and strengthen you as you study the book of James with your family! 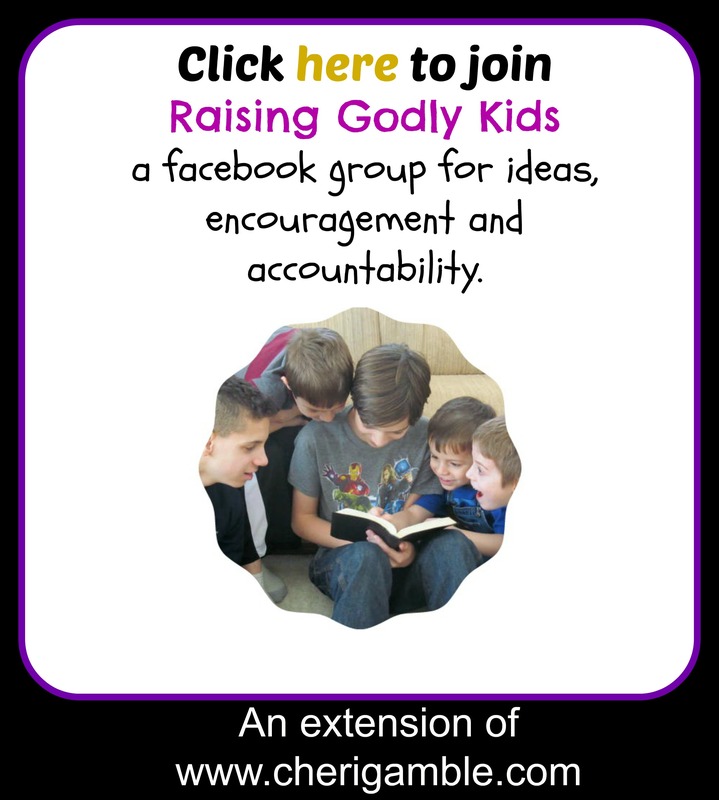 Before you go, please join our facebook group and like my facebook page for more encouragement and ideas as you raise godly kids in today’s society! ___ Day One: Read James 1:1-4. Think about it: What were they to consider joy? What types of trials were they experiencing? What types of trials do you face today? How can you consider your trials a joy? Pray about it: Ask God to help you rejoice in your trials. ___ Day Two: Read Genesis 37. Think about it: Who experienced a trial in these verses? How did he live out James 1:2-4 in his life? Pray about it: Pray for trials that you are facing, or for other people who are facing trials. ___ Day Three: Read Acts 5:27-42. Think about it: What happened to Peter and the other apostles? Why? How did they live out James 1:1-4 in their lives? Pray about it: Pray for those who are persecuted for their faith. ___ Day Four: Read Hebrews 12:1-3. Think about it: How can these verses encourage us as we face trials in our lives? Pray about it: Pray that you will endure to the end of the race! ___ Day Five: Re-read James 1:1-4. Make a card to send to Christians who are imprisoned for their faith. See https://www.opendoorsusa.org/take-action/write/ or http://www.prisoneralert.com/vompw_writing.htm for further instructions on this activity. ___ Day One: James 1:5-8. Think about it: According to these verses, what should you ask God for? How would you define wisdom? Pray about it: Ask God to help you grow in wisdom and to believe and not doubt! ___ Day Two: 1 Kings 3:3-15. Think about it: What did the Lord promise Solomon and how did Solomon respond? NOTE: Solomon basically asked for wisdom. He knew that the task he was assigned was too hard for him to do on his own. He needed God’s help. James 1:5-8 promises that if we ask God for wisdom, God will answer. God DID answer Solomon’s request. Today, Solomon is known as one of the wisest kings who ever lived. However, while Solomon was very wise in his leadership of his country, he was not very wise in his own family. He had many wives and his wives eventually led him astray. The end of Solomon’s life is a sad story of someone who started out strong and trusted God, but ended his life far from the Lord. Pray about it: Pray that you will be wise in ALL areas of your life. ___ Day Three: Luke 2:41-52. Think about it: After this event, what does the Bible say Jesus did? How did Jesus grow? NOTE: Jesus went home with his parents and obeyed them. He then grew in many ways, among which is wisdom. Is there a relationship between obeying your parents and growing in wisdom? Pray about it: Pray that you will grow in the same areas that Christ did. ___ Day Four: 1 Corinthians 1:20-25. Think about it: What do you think these verses mean? Can you think of any examples of situations where man’s “wisdom” is foolish? Pray about it: Pray that God will help you to be able to tell when man’s “wisdom” is really foolish! Remember, our GOD IS SO BIG SO STRONG AND SO MIGHTY!!! ___ Day Five: James 1:5-8. This week’s Scripture compares a man who doubts with a wave blown and tossed by the wind. Waves can wash away and damage things, too. Search for an area that has recently been devastated by waves or wind (such as a tsunami, hurricane, or tornado). Brainstorm ways to raise money or offer help for the survivors. Put one of your ideas into action! ___ Day One: James 1:9-11. Think about it: What do these verses teach us about the pursuit of money? Pray about it: Pray that God will help you to seek after Him! NOTE: While money itself is not evil, we need to be careful to not value money above all else. In the end, all that really matters is our relationship with Jesus Christ! ___ Day Two: 1 Kings 21:1-19. Think about it: Why do you think Ahab wanted Naboth’s vineyard? Why was he not satisfied with what he had? Are you ever guilty of wanting more and more, even when you don’t need those things? Pray about it: Ask God to help you to be content with what you have. ___ Day Three: Luke 12:13-34. Think about it: What should you seek most of all? How can you do this? How will seeking after Jesus first help you have true treasure? Pray about it: Ask God to help you learn what it means to store up treasures in heaven. ___ Day Four: Matthew 6:19-24. Think about it: What are some ways that you are tempted to store up treasures on earth? Pray about it: Spend time today praying for the world’s poor – and also the world’s rich! ___ Day Five: James 1:9-11. How can being content help you to not covet what someone else has? Make a list of all you have that you are thankful for. See how long you can get that list to be! ___ Day One: James 1:12-15. Think about it: What do these verses say about temptation? Can you think of anyone in the Bible who resisted temptation? Pray about it: Ask God to help you resist temptation! ___ Day Two: Genesis 39. Think about it: How did Joseph respond to his temptation? How does his story relate to James 1:12-15? Pray about it: Ask God to help you to RUN when temptation is strong! ___ Day Three: Matthew 4:1-11. Think about it: Why do you think Jesus was tempted? How did He resist His temptations? How can knowing that Jesus was tempted and resisted help you when you are tempted? Pray about it: Ask God to help you remember Bible verses when you are tempted. ___ Day Four: 1 Corinthians 10:13. Think about it: What is the promise in this verse? How can this verse help you when you are tempted? Pray about it: Thank God for His faithfulness to you and ask Him to help you remember this verse when you are tempted. Optional Challenge: Try memorizing this verse today! ___ Day Five: James 1:12-15. Serve as an encouragement for those who have given in to temptation and gotten in a great deal of trouble, Make cards for prisoners or see about organizing a group to lead a chapel service at a prison or juvenile detention facility. ___ Day One: James 1:16-18. Think about it: What are some examples of “good and perfect gifts”? What does it mean to you that God never changes? Pray about it: Thank God for His gifts to you and for the fact that He never changes! ___ Day Two: Genesis 1. Think about it: What good gifts did God give us according to these verses? Pray about it: Spend time thanking God for your favorite parts of His creation! Something extra to do: Make a creation collage or creation mobile by drawing pictures or finding pictures in old magazines to represent each day of creation. ___ Day Three: Luke 11:5-13. Think about it: What do these verses tell us about God’s love for us? NOTE: Verse 13 tells us that God gives the Holy Spirit to His children. This is a fantastic gift that we receive when we become a Christian. The Holy Spirit lives inside of us and guides us, helping us to make the right decisions and to have the strength and courage we need to do the jobs that God has for us. How does that make you feel? Pray about it: Spend time today thanking God for the gift of the Holy Spirit. ___ Day Four: 1 Peter 4:10-11, Romans 12:6-8. Think about it: According to these verses, what has each person received? Do we all have the same gifts? What gifts do you think God has given you? Pray about it: Ask God to help you use your gifts to serve Him! ___ Day Five: James 1:16-18. Make a special gift for a lonely neighbor. Deliver it and share God’s love with that person! A great song for this week as we think about the AWESOMENESS of God! ___ Day One: James 1:19-21. Think about it: According to these verses, what should you be quick to do? How would following these verses change the way you interact with others? Pray about it: Ask God to help you listen more and talk less. ___ Day Two: 1 Samuel 18:6-16. Think about it: How did Saul NOT follow the words of James 1:19-21? How did his actions affect his life and those around him? Pray about it: Ask God to help you control your anger and to not take it out on others. ___ Day Three: Matthew 2. Think about it: Who was angry in this passage? How did he act out his anger? How does this relate to James 1:19-21? Pray about it: Ask God to help you deal with your anger in a way that pleases Him. ___ Day Four: Ephesians 4:26, Proverbs 20:3, Proverbs 15:1-2. Think about it: What can these verses teach you about anger? How can you control your anger? Pray about it: Ask God to give you a kind and gentle spirit. ___ Day Five: James 1:19-21. Make a caricature of yourself. Be sure to overemphasize the ears and underemphasize the mouth in keeping with James 1:19! ___ Day One: James 1:22-25. Think about it: What is the difference between a hearer of the Word and a doer of the Word? Can you give examples of both? Which one are you? Pray about it: Ask God to help you be a DOER of the Word. ___ Day Two: 1 Chronicles 34:1-7, 14-21, 31-33. Think about it: What did Josiah do when he decided to follow God? What were the changes that came about? How do these verses relate to James 1:22-25? Pray about it: Ask God to show you ways that you need to change in order to fully obey Him. ___ Day Three: Matthew 21:28-32. Think about it: Which son are you like? Pray about it: Ask God to help you to always do what He wants you to do. ___ Day Four: Colossians 3:23-24, Ephesians 2:8-10. Think about it: How would living out these verses change your attitudes towards the things that you do every day? Pray about it: Ask God to give you the right attitude of service to Him. ___ Day Five: James 1:22-25. DO SOMETHING! Find a cause you believe in and do something about it! ___ Day One: James 1:26-27. Think about it: How important is the tongue to our witness? Why do you think that the person who does not have a tight reign on his tongue has a worthless religion? Pray about it: Ask God to help you keep a tight reign on your tongue! ___ Day Two: 2 Kings 4:1-7. Think about it: How did Elisha help the widow in today’s lesson? How does this relate to James 1:26-27. Do you know any widows? How can you help them today? Pray about it: Pray for a widow that you know. ___ Day Three: Acts 6:1-7. Think about it: What was happening to the widows in this passage? How did the early church solve the problem? What does this tell us about their “religion”? How is your church doing at taking care of the orphans and widows in your community? Pray about it: Pray for opportunities to help meet the needs of others in your community today. ___ Day Four: Philippians 4:8-9. Think about it: What are the types of things that we should be be filling our mind with? How do these verses relate to James 1:26-27? Pray about it: Ask God to help you fill your mind with the WHATEVERS from Philippians 4:8-9. ___ Day Five: James 1:26-27. Decide on a widow that you will take under your wing as a family. Mow her lawn through the summer, rake her leaves, shovel her snow, clean her house, etc. Find ways that you can bless her and help take care of her. Now that you’ve finished reading the 1st Chapter of James, let’s hear it one more time! If you memorized the verses, why don’t you make your own video? You can share it on my facebook page or in the Raising Godly Kids facebook group! And now that you are finished with James Chapter One, it’s time to move on to James Chapter Two!